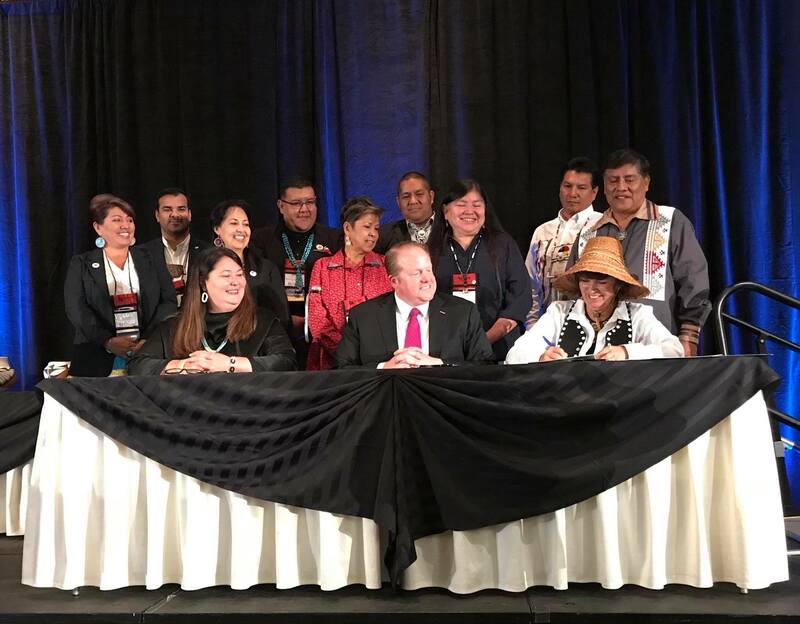 As we enter January, we can’t help but note that 2018 was an amazing year for the American Indian Alaska Native Tourism Association as well as a successful year for tourism throughout Indian Country in the United States. Join us in celebrating some of our top accomplishments and memorable moments for the past year. Mou Sigining: On Sept. 18, 2018, Tara Sweeney, Assistant Secretary of Indian Affairs and Mike Platt, Assistant Secretary for Legislative and Intergovernmental Affairs for the Department of Commerce joined Camille Ferguson, Executive Director of AIANTA in signing an historic Memorandum of Understanding naming AIANTA as the national facilitator to carry out the NATIVE Act, which was signed into law in 2016. American Indian Tourism Conference: The signing was held during AIANTA’s 20th annual American Indian Tourism Conference, held at the fabulous Isleta Resort & Casino in Albuquerque, New Mexico. The 2018 conference attracted respected speakers who provided training and networking opportunities to more than 300 attendees, representing tribal tourism entities and other hospitality organizations around the country. Juan Bautista de Anza National Historic Trail: AIANTA inked a new partnership with the National Historic Trails (National Park Service) to find and tell the stories of the Southern Arizona and Southern, Central and Northern California tribes associated with the Juan Bautista de Anza National Historic Trail. Cultural Heritage Certificate Program: Working jointly with the George Washington University, AIANTA launched its second Cultural Heritage Tourism Certificate Program, with 43 participants. Regional Outreach: AIANTA participated in 21 speaking engagements globally, including attendance at the National Indian Gaming Association’s annual convention, the Affiliated Tribes of Northwest Indians Conference, the Indigenous Tourism Association of Canada’s annual conference and the Smithsonian National Museum of the American Indian Living Earth Festival. International Marketing: AIANTA raised the profile on Indian Country tourism internationally by participating in the world’s top tourism trade shows, including taking the stage with other tourism leaders at the Sustainable Tourism Session at the World Travel Market. AIANTA also attended ITB Berlin with four industry partners and participated in Visit USA Showcase Italy and Brand USA’s IPW in Denver, Colorado. The association also gathered 35 tourism industry professionals at its annual Go International training workshop held every January in Albuquerque. Pacific Northwest Tribal Fam Trip: In partnership with Brand USA, AIANTA hosted a fam trip throughout the Pacific Northwest, which visited seven Tribes, and was attended by Italian journalists and tour operators, immediately following IPW 2018. New Personnel: AIANTA expanded its administrative staff, adding a new Administrative Assistant, PR & Media Manager, an Education Manager and an Education Events Coordinator position. AIANTA’s Database of Native American Tourism Assets continues to grow, and now includes tourism assets for 248 tribes and 32 Alaska Native Villages and Corporations. Updated and expanded aianta.org website. Looking ahead, 2019 is also shaping up to be a big year for AIANTA. The association plans to hire a new international outreach coordinator and a public lands manager, which will further help us provide increased educational programming, training and technical assistance while also elevating the profile of tourism to Indian Country in the United States. Also, look for our State of Indian Country Tourism survey, to be released very soon. We look forward to working with you all this coming year.